So It has been a lot since I last touched something related to CSS so I'm not aware if there are any changes but today I wanted to use stylish to edit and old code that made 2 years ago and I was shocked with all the issues that the editor signaled. The use of ID selectors ? The use of adjoining classes ? The use of !important ? The use of Attribute selectors with ^= ? And what's this message ? Fallback background-color (hex or RGB) should precede RGBA background-color. Is this normal ? Should I just ignore this ? If no then what should I do because of course I need ID selectors, they exist for a reason. 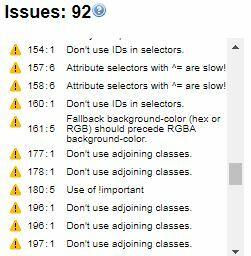 These are just warnings from the CSS validator (="linter"). You can ignore them. If you want to use another linter, use Stylus instead of Stylish. There you can choose different linters and customize the rules or deactivate at all.